Another hockey season has come and gone. Ever since moving to the states, I rarely watch hockey because of the horrible coverage here in Cleveland. There is ESPN and MSNBC, but have no interest in showing the Canadian teams. Once in while, they'll have a good game on, but it pales in comparison to Hockey Night in Canada or TSN. Since I live in Ohio, the SportsOhio network televises the Bluejackets games. The turdjackets are so bad, I would rather watch the Scripps Spelling Bee competition. 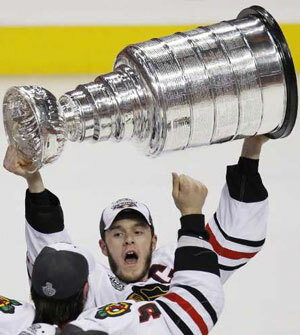 It was a great playoffs and the Cup finals was thrilling as the Chicago Blackhawks finally brought home the hardware to their championship starved fans who haven't seen the cup since 1961. I'm sure many of them weren't born during the glory of years of Hull and Mikita. That of course put the Leafs next in line as the current longest cup drought at 43 years. That's all I need to hear from the old man as he'll bring that up over and over. The Leafs are far from bringing home the cup unless they stop trading away high draft picks and signing washed up bums who want to fulfill their childhood dream of playing for the Leafs.